After another fairly slow start this morning we found the car and decided to head off without the benefit of the GPS. Of course we got lost almost immediately, the D8 road we planned to follow never materialized and we ended up in the hills far north of our planned route. However, of course, we found ourselves on our feet and followed signs to Grotte de Limousis. After several km of narrow, winding, steep road through rocky, schrubby country we had almost decided to give up when we found ourselves in a car park with a nice shop/ticket office where we had (another) coffee while we waited for a tour of the cave. The tour was in French but the guide was quite droll and included us, finishing most commentary in English. The cave is about 600 metres deep with several chambers and has been guided commercially since the 1830s. 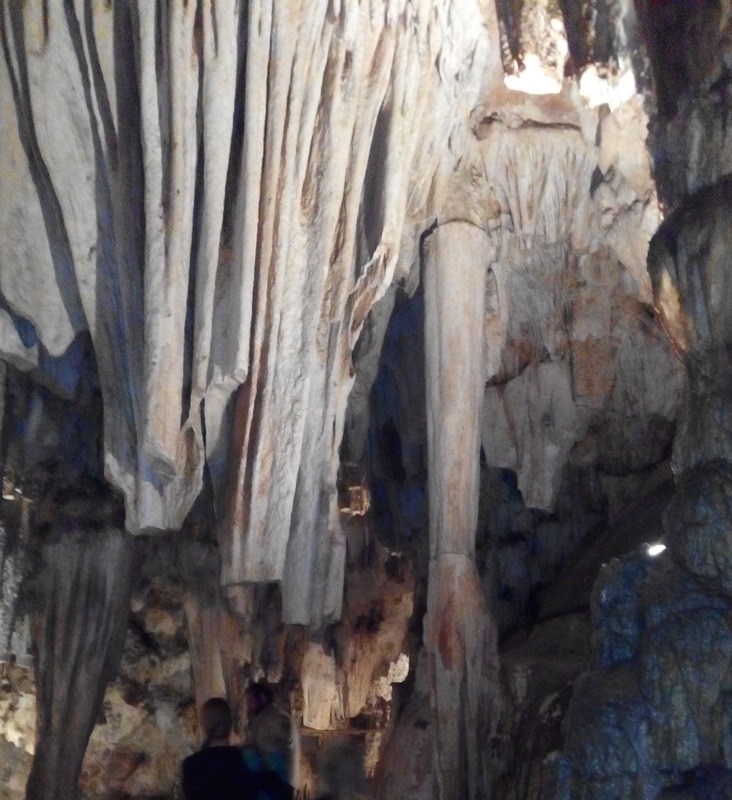 The whole cave has great formations, columns, stalagmites and tites and some excellent chrystaline structures. Evidence has been found of human habitation and we were shown scratching said to have been made by cave bears several thousand years ago. Leaving the cave we stopped to listen to the Super 15 final on line. Enough said. We drove on to Beziers where we are booked for 2 nights and after the inevitable problem finding parking checked into the Hotel de France, another tired budget hotel but satisfactory and cheap at less than $100 per night. Lunch came next , I had a warm goats cheese salad, then a longish walk to the Canal de Midi (again) with a large port basin, a deep lock and an aquaduct where the canal crosses the (l’Orb) river. Diner next and perhaps a walk to the Cathedral/fortress. Hi again, we still enjoy looking to see where you are each day, and what you are eating. Perhaps your diet will have subtle changes once you are home again.